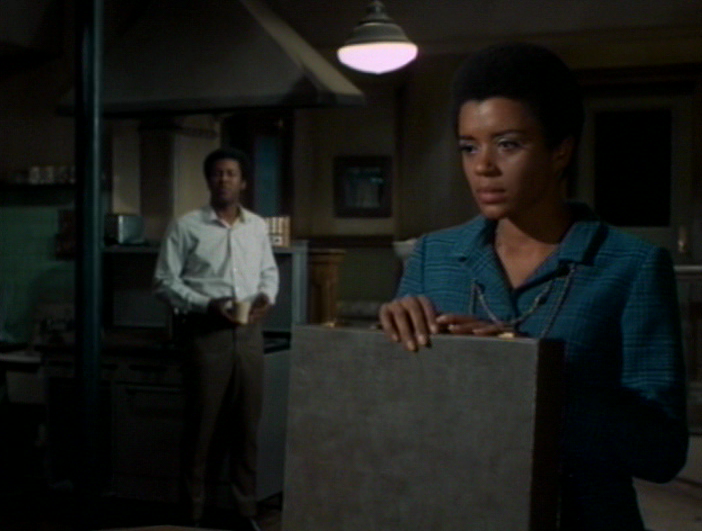 Steve Ryfle has posted a thorough obituary at Bright Lights Film Journal for Janet MacLachlan, the African American leading lady who guest-starred in scores of television episodes from the late sixties up through the current decade. MacLachlan died on October 18 at the age of 77. All I can add to Ryfle’s piece are a few quotes from a brief phone interview I did with MacLachlan in February 1996, in which she discussed the beginning of her television career. MacLachlan’s dog, Angus, was barking loudly enough in the background to interrupt us, and then another call on her end brought an end to a conversation that I wish I had continued in a second session. Rather than seek out roles in the few dramatic series that were shooting in Manhattan at the time, MacLachlan took the television plunge in a big way. She moved to Los Angeles in 1964, armed with a contract from Universal, which was so flush with television production that it had launched a program to recruit young actors a few years earlier. MacLachlan joined a stable of inexperienced contract players similar to those maintained by the major movie studios during the thirties and forties. Her first role at Universal was a bit part in a 1965 Alfred Hitchcock Hour (“Completely Foolproof”). “The director who directed my screen test was directing that episode, Alf Kjellin. So Alf brought me in to play that secretary,” MacLachlan remembered. “It was just this tiny scene, and I rushed in to do that, because Alf and I became very good friends.” Kjellin, a handsome actor who had worked for Ingmar Bergman in his native Sweden, was by that time a mid-rank director of American episodic television. Just a few weeks later, MacLachlan filmed a part in another Hitchcock Hour, this one a modern-dress version of a classic W.W. Jacobs horror story called “The Monkey’s Paw – A Retelling.” MacLachlan, in her first substantial supporting part, played a member of the entourage surrounding decadent jet-setter Collin Wilcox. The cast included two other future television stars, Stuart Margolin (Angel on The Rockford Files) and Lee Majors. MacLachlan was miserable because she hadn’t yet gotten used to acting on camera. “It was a major shift for me in terms of doing things out of continuity and keeping my energy up and understanding about close-ups. I was terrified,” she said. Margolin, who had a bit more experience, took MacLachlan under his wing and taught her some of the basics of film technique. MacLachlan, in turn, helped Majors with the Spanish he had to speak in the show. MacLachlan told me that she had gotten the “Monkey’s Paw” role thanks to Monique James, a legendary agent and casting executive who had fostered the careers of Robert Redford and Richard Chamberlain. At Universal during the mid-sixties, Katharine Ross, James Farentino, James Brolin, Susan Clark, David Hartman, and Harrison Ford numbered among James’s discoveries. Though she didn’t elaborate on what she meant by “non-traditional,” MacLachlan may have been referring to race. Neither of those roles was written for a black actress. And while it probably wasn’t a fight for James to cast a person of color – this was a moment in the Civil Rights Era where the networks were eager to fend off media criticism by pointing to positive depictions of African Americans in their shows – the parts probably would have gone to white actresses had MacLachlan been without a cheerleader. MacLachlan may have been the second leading lady on television (after East Side / West Side’s Cicely Tyson), and the first based in Los Angeles, to wear an afro most of the time. As MacLachlan advanced to bigger parts, colorblind casting became less common. Because interracial romance was not yet permissible on television, MacLachlan came to occupy a niche as a one-off romantic partner for nearly all of the young African American leading men who emerged in the late sixties. 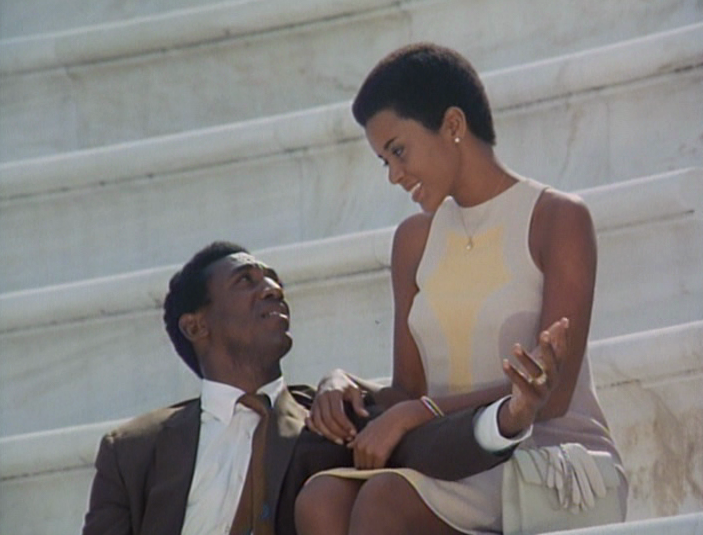 She worked opposite Clarence Williams III (Mod Squad), Don Mitchell (pictured above in Ironside), Georg Stanford Brown (The F.B.I. ), Raymond St. Jacques (The Invaders), Brock Peters (Longstreet), Sammy Davis, Jr. (The Name of the Game), and boxer Sugar Ray Robinson (Run For Your Life). Irving Pearlberg, a television writer and producer active from the mid-sixties through the mid-eighties, died on June 29. Pearlberg’s first TV script, as far as I can determine, was a good Kraft Suspense Theatre from 1964 entitled “Charlie, He Couldn’t Kill a Fly.” It was about a town loudmouth (Keenan Wynn as Charlie), all bluster and no bite, who finds that after he’s accused of murder he wins the attention and respect of neighbors who didn’t take him seriously before. Charlie offers a false confession and undergoes a crisis of identity as the authorities come closer to discovering who did the killing. It was a familiar story that’s been done by many a crime show. In fact, one could say that Pearlberg was paid the ultimate compliment when The Defenders telecast a blatant lift of his Kraft script only five months later. That episode, “Hero of the People” (written by Rod Sylvester and William Woolfolk), featured Gerald O’Loughlin as the milquetoast who gains sudden celebrity after killing someone. In both shows, so as not to muddy the ethical issues at hand, the dead man was a drug peddler, the scourge of the community. Also in both, there was the hint that the protagonist’s trampy wife/girlfriend (Beverly Garland on Kraft, a young Ann Wedgeworth in The Defenders) was turned on by his act of vigilantism. Pearlberg (or the producers of Kraft Suspense) could have sued – assuming the premise of “Charlie, He Couldn’t Kill a Fly” had not itself been borrowed from someplace. After Kraft Suspense Theatre, Pearlberg quickly moved into staff jobs, working as the associate producer (really a story editor) on the final, serialized season of Dr. Kildare (1965-66) and then moving over to do the same task for The Man From UNCLE (1966-68). Both were MGM shows produced by that studio’s main TV guru, Norman Felton. Following the stint for Felton, Pearlberg went freelance, but gravitated toward series in production at Universal’s busy TV factory: Ironside, The Name of the Game, The Bold Ones (two episodes of the “Doctors” cycle), Alias Smith and Jones, Columbo. On an unusual number of these segments Pearlberg’s name appears atop a group of complex split credits, which suggests to me that he may have enjoyed a reputation as a reliable script doctor. The family’s obit for Pearlberg condenses his resume to “a wide variety of police dramas,” which is true – he wrote for The Rookies, Police Woman, Baretta, Eischeid, Paris, Hawaii Five-O, and Quincy – but I would venture this was less a personal specialty than an index of what the market was buying during the seventies. Pearlberg also branched out into comedy (The Courtship of Eddie’s Father) and did scripts for two fish-out-of-water shows about transplanted city professionals starting over in the sticks (Apple’s Way and The Mississippi). His last credits were on The Paper Chase and Falcon Crest. Pearlberg was a classic example of the all-purpose TV writer.